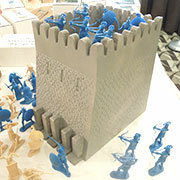 I've finally posted my first few photos from the 35th Annual OTSN Chicago Toy Soldier Show. As always, the show has been very enjoyable so far. Some dealers I've talked to have had slower sales than usual for this time during the room trading, while others have reported sales more in line with the past few years. New plastic product from Action Casting's (John Stengle, Jr.) Vietnam era U.S. Marines, LOD's Trojans and Greeks, and Barzso Playsets' Pirate Schnoor. Paragon should be arriving at the show today (Saturday), and I will try to get photos of their new figures. I'll also be taking and posting many more photos of room trading and of the show on Sunday. For now, here are the first few photos.